I've always liked the idea of Shepherd's Pie. In it's most basic form, it's a simple stew to make. I've had this in restaurants, and I've made it myself. Sandra likes it as well... up to a point. I'll explain that in a bit. For the life of me, I cannot remember when I first had Shepherd's Pie. I do not remember having it at home as we grew up at all, nor do I recall having it when I was living in Miami. I do know that when I was working in the North End of Boston (between 1987 and 1992), I not only knew what Shepherd's Pie was, but I had it on a semi-regular basis at some of the restaurants nearby. To this day, the best version of the dish that I've had was from The Black Rose restaurant and pub on State Street near Quincy Market in Boston. I went there on a regular basis and had Shepherd's Pie there more often than not. Sandra and I have a nice set of covered bowls that we used many times for making onion soup. 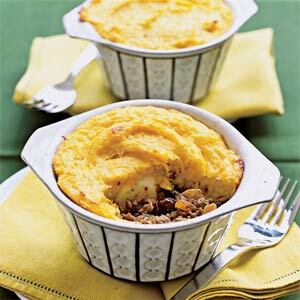 The first time I made Shepherd's Pie at home, I knew that I just HAD to use those bowls! I've seen presentations of Shepherd's Pie since, usually made in a large casserole dish with portions cut out with a spatula, and to me, this is just no way to make the dish. It's not that much more difficult to cook it in the bowl that you will be serving it in, as long as the bowl is oven safe, of course. Anyway, I didn't have too much trouble putting the recipe together. As I said, the ingredients were easy to detect from tasting it. I just sautéed the ground lamb and added freshly chopped onions (you don't want your vegetables too prominent in this dish), and continued cooking until the meat was done and the onions translucent. I may have added some chopped carrots that first time--I'm not really sure. I know I added some frozen peas near the end, to let them thaw out. I then portioned the meat and vegetable mixture into the bowls, and then spooned some instant mashed potatoes (yes, I really used instant!) on top. I baked the bowls in a 350°F oven, and cooked it for about 10-15 minutes. Afterward, I turned the heat up in the oven and switched to Broil to give the potatoes a bit of a brownish tinge--about 4-5 minutes. When the meal was served, I was ecstatic. The meat was bubbling underneath the dome of mashed potatoes. In fact, when I made a hole in the potatoes to get to the meat, a lot of steam came out of it! The taste was right on the spot! Sandra, on the other hand, didn't like it much. The problem was that she doesn't like lamb at all. Not grilled, not cubed for Irish stew, and (apparently) not ground. The lamb was the deal breaker for her. In deference to her, in all my subsequent efforts in making this dish, I've been using ground beef. I think that ground beef lessens the "authenticity" (at least to the Black Rose taste I came to love), but it is perfectly workable, and I've come to enjoy the beef variety. Sandra does, too. Last week, I asked Sandra if she'd like Shepherd's Pie. I got the idea from watching a show on Irish Pubs on the Canadian version of the Food Network. (Interestingly enough, The Black Rose was featured prominently on that show!) She thought it would be a great idea, but she didn't know how much mashed potatoes to make (she doesn't like instant mashed potatoes much, and doesn't mind making them from scratch for a meal). I went shopping and got the requisite ground beef. Market Basket also had some Angus "pub burgers" (large, ⅓ pound burgers) and I bought them for a Salisbury Steak meal. When I told Sandra of my purchases, we figured it would be a great idea to make the Salisbury Steaks one night, and Sandra would make an extra helping of mashed potatoes. She put them in the refrigerator overnight, and then I used them to spoon over the bowls. It had been a couple of years since I made Shepherd's Pie, but it turns out that I still have the knack! Boil potatoes in salted water until tender, about 12 minutes. Drain potatoes and pour them into a bowl. Combine sour cream, egg yolk and cream. Add the cream mixture into potatoes and mash until potatoes are almost smooth. While potatoes boil, preheat a large skillet over medium high heat. Add oil to hot pan with beef or lamb. Season meat with salt and pepper. Brown and crumble meat for 3 or 4 minutes. If you are using lamb and the pan is fatty, spoon away some of the drippings. Add chopped carrot and onion to the meat. Cook veggies with meat 5 minutes, stirring frequently. In a second small skillet over medium heat cook butter and flour together 2 minutes. Whisk in broth and Worcestershire sauce. Thicken gravy 1 minute. Add gravy to meat and vegetables. Stir in peas. Preheat broiler to high. Fill a small rectangular casserole with meat and vegetable mixture. Spoon potatoes over meat evenly. Top potatoes with paprika and broil 6 to 8 inches from the heat until potatoes are evenly browned. Top casserole dish with chopped parsley and serve.